Happy Sunday everyone! My Sunday's are a lot more laid back than the rest of the week, so this is one of the days where I try to find a fun new pattern. If you're like me, then here's one you can make and finish today! 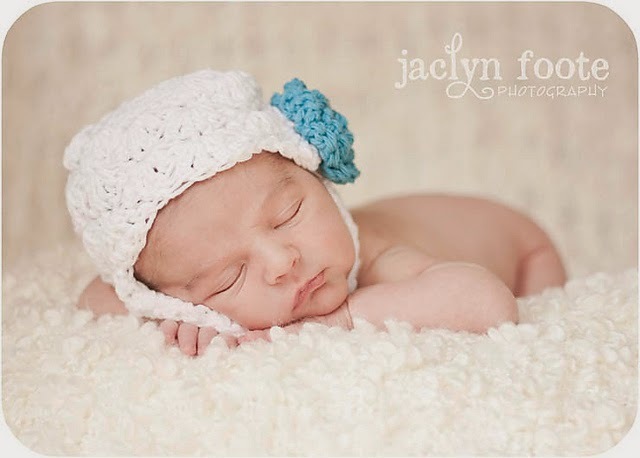 The shell stitch brings a feminine touch for your new baby girl. You can knit, crochet a flower or a bow. Or you can put a fabric flower on it too! First I want to tell you when I saw the picture of this hat, I fell in love with it. And what was even better was that there was a pattern (free) for it. So I sat down today to finally make it and got quite upset when I got to the end and found out that your pattern doesn't hold true to the picture. In the pic you have what i think are ear flaps or at least ties, your pattern is only that of a beanie. Why?